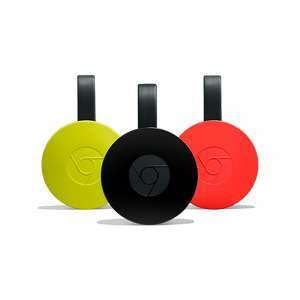 Most of the offers are gone for the google chromecast now after "BF" and "CM" has finished and i thought i missed out but Google Store direct still have it for £19 and free shipping (3-5days). FROM THEIR SITE: Promotion period started Nov 22, 2017 at 12:00 AM PST and ends Nov 29, 2017 at 11:59 PM PST. Unless otherwise allowed, this offer cannot be combined with other offers. You can get a 1st generation one in CEX for £18 quid. It'll still do the …You can get a 1st generation one in CEX for £18 quid. It'll still do the same job as the 2nd gen one. £1 saving? May as well get the new one. You can get a 1st generation one in CEX for £18 quid. It'll still do the same job as the 2nd gen one. I just replaced a gen1 with a gen2 as being able to use 5Ghz wifi for a faster, more reliable connection was worth it. With the gen1 I had to turn plex's bitrate down otherwise it struggled, no such problems with gen2. I like being able to control Netflix from my Google home (or casting from my phone) using my Chromecast. That's the only advantage I can think of personally, but if you don't have a Google home or don't want that functionality I can't think of much reason not to just use the PS4. Though I guess others may have other suggestions as to why you might want it. why would this be better than a Fire TV Stick? Unable to purchase. Theres an error on the last screen. So which is the better option Chromecast or Fire stick, or are they different animals? Its cleared now, managed to buy one. So which is the better option Chromecast or Fire stick, or are they …So which is the better option Chromecast or Fire stick, or are they different animals? Just ordered at £19, thanks! If you have a smart tv you can cast direct to that without one of these devices fine. Bought two from Maplins for this price over the weekend, love em, highly recommend if you have a TV and a smart phone. Really! OP should have noticed the offer is valid on Pacific Standard Time. Still a good 6 hours left yet. OP should have noticed the offer is valid on Pacific Standard Time. Still …OP should have noticed the offer is valid on Pacific Standard Time. Still a good 6 hours left yet.